Origin and Habitat: Jensenobotrya lossowiana grows in a geographically isolated spot on Dolphin Hill, a low isolated sandstone mountain (200 m high) situated between Walvis Bay and Luderitz in the restricted diamond area of the Namib (Distr Luderitz-South) in Namibia. The place is inaccessible except by boat or by crossing the lagoon at very low tide. Altitude: 20-100 meters above sea level. Habitat: Jensenobotrya lossowiana grows in sandy soil in crevices of gneiss among quartzitic sandstone fragments near the sea in a very barren habitat almost completely deprived of any vegetation, the branches often covered in lichens. Some of the plants on Dolphin Hill may be a few hundred years old, surviving, like Welwitschia mirabilis, on the fog and saline mists rolling in from the Atlantic. The rain occurs mainly during winter (cyclonic cold fronts) and ranges between 15 and 20 mm per annum. Temperature remains cool throughout the year except when offshore bergwinds occur and temperatures can rise to above 40°C. A very few plant can exists here, with the notable exception of Jensenobotrya lossowiana, Drosanthemum luederitzii, Lycium decumbens, Tylecodon schaeferi, Pelargonium cortusifolium, Pteronia spinulifera and Tetragonia decumbens. Seedlings develop in suitable crevices establishing new plants. Jensenobotrya lossowiana is well protected as it grows in a very isolated, undisturbed location. To the east it is surrounded by a sea of high sand dunes and to the west by the Atlantic Ocean. Large herbivores are thought to be absent but the plants are very fragile and easily damaged. It is threatened by habitat loss. Since the plants are easy to keep and to flower in cultivation, this is one of the examples of a taxon rare in habitat but very common in numbers out of its area. 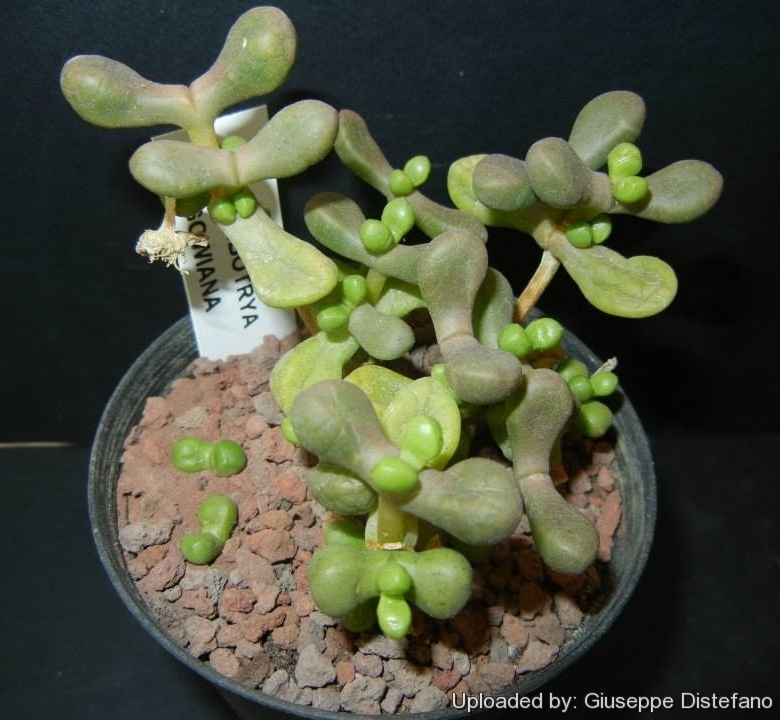 Description: Jensenobotrya is a monospecific genus (consisting of only one species) belonging to that great succulent family, the Mesembryanthemaceae. The single representative Jensenobotrya lossowiana is a densely leaved, decumbent shrubs forming large dense mats 40-100 cm in diameter with thick woody, branches prostrate or hanging down the cliffs. The plants have a very dense habit with reddish leaves looking like grapes ('botrya' means 'bunch of grapes'), but in cultivation rarely resemble the thick, woody ancient vines which hang down the slopes in its place of origin. Stems: Elongate with internodes soft and spongy. Jensenobotrya has a peculiar stem formation. The old stems are bare for up to two-thirds of their length and become as thick as an arm (to 70 mm in diameter) brittle and covered with dark brown to blackish, flaking, longitudinally fissured bark. It is thought that these branches may reach an age of at least 200 years! The younger branches have spongy internodes 5-10 mm long and up to 5 mm in diameter which are brownish at first and bear the remnants of old persistent leaves. Leaves: Almost globose, opposite with the leaves of a pair fused at their base, elongating into clavate shape in cultivation, blunt and faintly keeled, juicy, basal 5-7 mm in diameter, apical 12-15 mm in diameter, smooth, waxy, grey-green, greyish-pink, reddish or purplish green, but often green in cultivation. Two or three functional leaf pairs are borne at each branch end with the second and/or third pair gradually withering as moisture is recycled to the pair above. The stomata (breathing pores) are not sunken as in many desert plants. Flower: Ebracteolate, pale pink, often basally white, 20-25 mm in diameter with 40-60 petals in two series. Sepals 5, reddish purple 4-5 mm long, with blunt ends and thin, translucent margins. Pedicels 10 mm. Nectar glands dark green in a ring on the margin. Stamens 170-250 spreading, about 3-4 mm long with white filaments and yellow anthers; filamentous staminodes absent. The ovary is flat or concave on top. Five awl-shaped (subulate) ascending stigmas arise in the centre of the top of the ovary. Blooming season: Flowers appear sparsely at any time of the year but more so during spring and open during the day. Fruits (capsules): 5- locular, withering quickly, ochre, base as long as broad about 10-12 mm in diameter above, thus funnel-shaped with slightly convex sides, the expanding keels ending in streamer-like wings with no covering membranes or closing bodies. The 5 valves open when moisture is applied (hygrochastic), the expanding (hygroscopic) keels pushing open the valves. The capsules are soft and disintegrate soon. 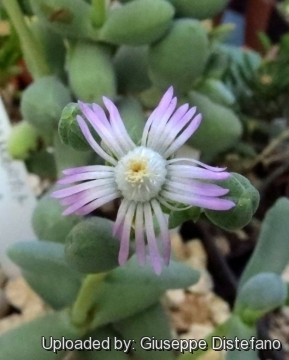 Taxonomic note: Jensenobotrya is closely related to the genus Delosperma from which it differs mainly in its fruit capsules which have unique pennant-like extensions of the expanding keels. 10) Burgoyne, P.M. “Jensenobotrya lossowiana : an island of genetic material in a sea of sand.” in: Aloe 35, 3 & 4: 94-96.1998. 13) Herre, H. “Genera of the Mesembryanthemaceae.” Tafelberg, Cape Town & Johannesburg. 1971. 15) Robinson, E.R. & Giess, W. “Report on the plants noted in the course of a trip from Luderitz Bay to Spencer Bay” in: Dinteria 10: 13-17.1974. Cultivation and Propagation: Jensenobotrya ere relatively easy to grow, paying attention to their particular growing requirements. If you provide the Jensenobotrya with the right conditions, they will reward you with their unique shape, size, colour and a proliferation of blooms. Jensenobotrya lossowiana is best grown as a container plant, or, in a dry climate, on steep half shady to sunny embankments. Growing rate: Slow growing for a mesemb and when grown in a container will become pendent. Watering It should be treated as a winter- and summer-growing plant and gently watered throughout the year (due to its dependence on regular fog). Water sparingly only when warm, no water when cold. Nearly all problems occur as a result of overwatering and poor ventilation, especially when weather conditions are dull and cool or very humid. Fertilization: Feed them once during the growing season with a fertilizer specifically formulated for cactus and succulents (high potash fertilizer with a dilute low nitrogen), including all micro nutrients and trace elements diluted to ½ the strength recommended on the label. They thrive in poor soils and need a limited supplies of fertilizer to avoid the plants developing excess vegetation, which is easily attacked by fungal diseases. Some growers fertilize frequently, some hardly ever. However, for the highly succulent mesembs fertilization is not really necessary. Light: They grow best in a cool situation and prefer a very bright situation or morning sun and in winter they need the maximum amount of light you are able to give them, but keep more cool and partially shaded in summer. The only exception to this is seedlings in their first year that enjoy a shaded place. Such tiny plants can easily get scorched or broiled and their appearance spoiled (this may not matter in the wild, where they have probably shrunk into the ground and becomes covered with sands). The low intensity of sun light during the growing season of this species generally prevents the flower flowers from opening. Special Advice: It is very fragile and should be handled as little as possible. - Mealy bugs: Mealy bugs occasianlly develop aerial into the new leaves and flowers with disfiguring results, but the worst types develop underground on the roots and are invisible except by their effects. - Scales, thrips and aphids: These insect are rarely a problem. Propagation: Jensenobotrya is easily propagated by cuttings planted in sand. This can be done at any time of the year but preferably during spring or summer. Take the cuttings from a grown-up mother plant and permit them to dry out a couple of days. The cuttings can be treated with a fungicide. Lay the cuttings on the soil and insert the stem end partially into the soil. Try to keep the cutting somewhat upright so that the roots are able to grow downward. Make sure that the container has sufficient drainage. Rooting is rapid and the young plants can soon be transferred to their new site. Jensenobotrya is also very easy to start from seed. Seeds germinate in 7-14 days at 21°C.